Commerce HQ vs Shopify - What's Better? Yo it's Alan Young and in this worlds best article I compare Commerce HQ vs Shopify so you can decide for yourself what's better. But not a lot is known about the new kid on the block CommerceHQ. Shopify was hands down the best E-Com platform available. A new beast has arrived! And I'm going to show you the difference between the two. Then check out the video at the bottom of the page where I compare Shopify vs Commerce HQ. On the other hand, If you love reading then enjoy! I'm just going to show you the difference. So the first big difference between Shopify and Commerce HQ is all the apps are built into the platform for free with CHQ. You have all the best apps without paying an extra penny with CHQ. Most people don't put the price of all the apps into the equation when they sign up for Shopify. When they realize the true cost of all the third party apps. This can then bump up the monthly subscription considerably. These The Apps Included With This Powerful eCommerce Platform. Commerce HQ is currently integrated with Custom Cat which has a huge array of apparel and accessories for POD. Also as a platform user, you get access to exclusive pricing and integration with their Print-On-Demand vendors. This is a great app if you're doing custom design products. On the product page, you can add an input box to allow customers to add the customiser details. Like details for an engraved bracelet for example. If you're already with Shopify and want to make the switch then you can with the platform migration app. You can migrate products, collections, customers and orders from Shopify to your new CHQ store. This allows you to set custom shipping price for any product. Also works great if you're doing free plus shipping. This looks so good on your products pages. You can allow your customers to leave reviews about products. It also allows you to manually upload your own reviews. Great if you want import reviews from AliExpress if you're dropshipping. This is an essential if you are doing Facebook marketing. You just get your link for the XML feed then paste into Facebook Ads in order to upload products to Facebook automatically. Perfect for FB retargeting with carousel ads. pages to gain more trust with your visitors. Plus you add upload your own. You can add a count down timer on your cart, checkout or both. Helps add that sense of urgency. You can use Zapier to integrate with 1000's of API's. For example, you can use Zapier to link your store to Quickbooks for accounting. To link your store with a third party autoresponder like Mailchimp. There are literary thousands of ways to use this app if you wanted. You can create pop ups to capture your visitors emails before they leave so you can follow up with them after they've left your store. You could also create a pop to offer a one time discount before they leave. Great to highlight any promotions you're running. These are nice and easy to use. You can add these promo bars to your store without any complicated code. This app allows you to display a timer on the product page to add urgency to your visitors which helps increase conversions. With this app you can displays the quantity of a product left on the product page. This helps add a sense of scarcity to your product listings. Another great app for increasing conversions. This app creates a pop up on the bottom corner displaying recent purchases on your store. This adds social proof to let people know that others are ordering from your store. A great little app for increasing trust in your store. – Plus More To Come! All the apps you need under one platform. Plus more are getting added regularly. And they are really slick looking themes that are built to convert. Which had no apps built in either. A decent theme for Shopify could cost upwards of $200 (or even more). I knew this platform wasn't messing around. And to make it even better you can build your own pages and themes with the visual builder. I told you they weren't messing around. They came to take over. It's hard not to see what eCommerce platform offers the best features. 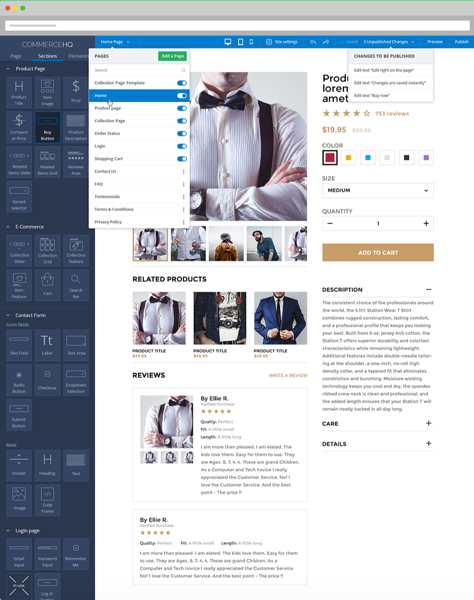 The Visual Store Builder is a game changer as Shopify you can't create your own store. Unless you hire expensive coders and that is a lot of effort in its self. With CHQ you can build beautiful themes, pages and e-Com funnels by simple drag and drop software. Again this is all included in the price. You have to pay for the mid-range or higher package for access to their abandoned shopping cart feature. Or you will have to pay for a third party app if want a good one. It's built in for free whatever package you are with. I feel like it sounds like I'm over hyping this, but it's all true you can check it out yourself. And there's more in this Commerce HQ vs Shopify comparison. Shopify charge up to a 2.0% fee for processing your payments with third-party gateways. It adds up when you're doing thousands in sales a week. CHQ rocks and is here to take over the eCommerce world. If you want to check out the video where I compare the Commerce HQ vs Shopify platforms then check out the video below. If you found this article useful then share it with you're friends. I will personally come round and thank you! Maybe I won't do that (unless you live round the corner), but I will send you a psychic thank you through the ether! Oh yeah here's my Youtube channel if you want to come and subscribe and be friends. Hi there, I want to subscribe for this web site to get latest updates, therefore where can i do it please help. Hey head over to my YouTube channel and you can subscribe to that for the latest info etc. Thanks for stoping by!